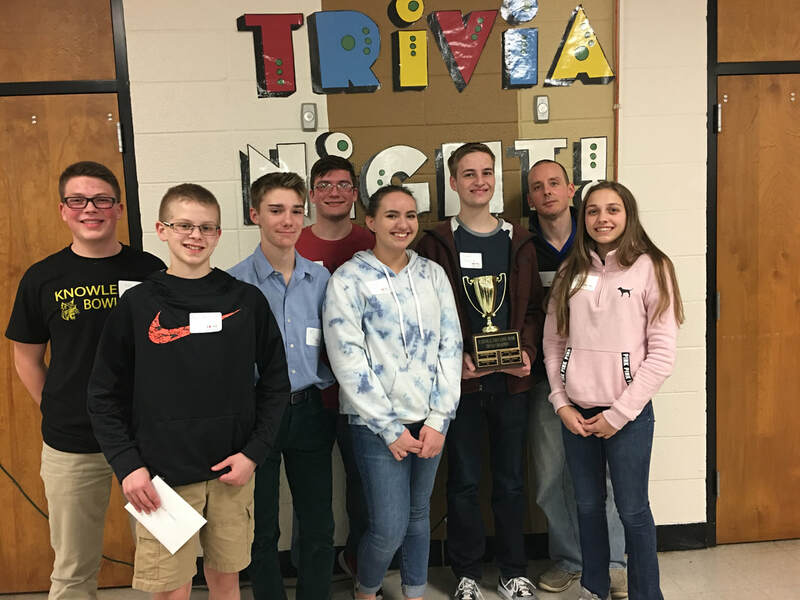 Trivia Night last Friday was a nail-biter to the very end with the Cassville High School Knowledge Bowl team, known as the Fighting Trout, as champions. 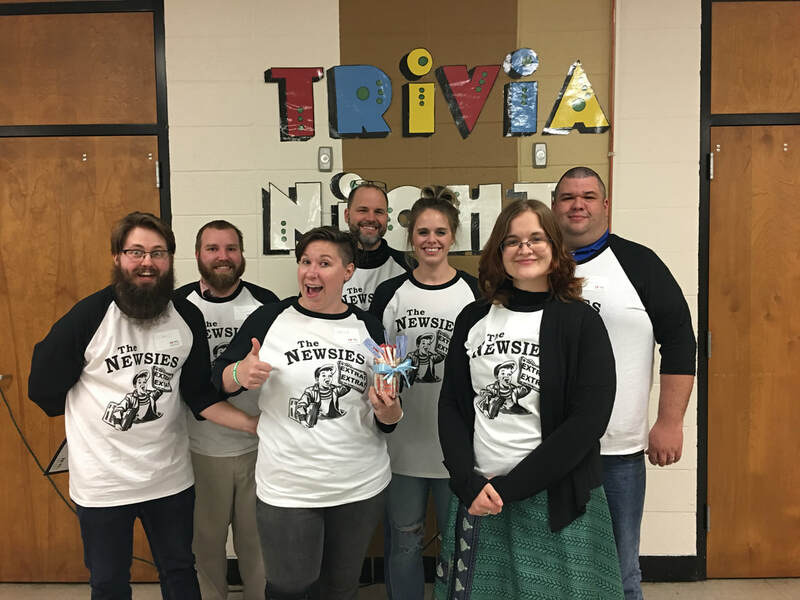 Trivia Night, which benefits the Cassville Education Fund, drew ten teams and raised $1,600 for the non-profit fund that provides grants to Cassville teachers for special programs. Once all of the punches were made, the Fighting Trout, a group of high schoolers, beat out last year’s champs, The Newsies, a team of seasoned journalists from the Barry County Advertiser and Cassville Democrat. (But don’t worry, we’re not bitter. Ends up our old joints aren’t made for those bonus point rounds.) The Fighting Trout came out on top with 51 points between trivia and bonus point minute-to-win-it rounds of fun games. The Newsies came in second and took home the Smarty Pants award with 48 points of trivia-only answers. 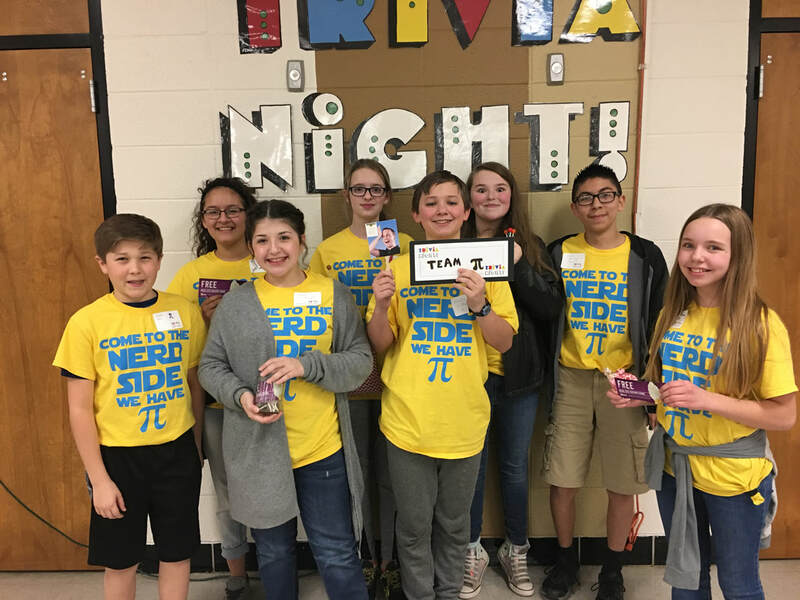 The final winning team was Team Pi, a group of optimistic Cassville Middle Schoolers who earned the Dum-Dum Award for the least points of the night. There were rumors that Team Pi threw the match for the jar full of suckers awarded at the end of evening, a strategy seriously considered by The Newsies at the beginning of the night. Each year, the Cassville Education Fund hosts the event of four trivia rounds and three game rounds. The trivia questions vary with categories of geography, pop culture, history, literature, sports and more. The in-between rounds feature games of skill, like getting a cookie from your forehead to your mouth, moving across the floor on a carpet square using only your feet and fishing out the marshmallows out of Lucky Charms using a spoon on your mouth and no hands. Bonus points for the minute-to-win-it rounds range are 5 points for first, 3 points for second and 1 point for first. After each round, the points are added up and trivia and game points dictated the winner of the traveling trophy. The fun, educational night is the annual fundraiser for the Cassville Education Fund. The fund then uses the proceeds of the endowment fund to help Cassville teachers pay for specialty programs and materials for their classroom. Teachers have to apply for the grants, and they are selected by the education fund’s board. This year’s emcee was Dusty Reid, director of facilities and operations for Cassville R-IV Schools. The winning team, the Fighting Trout, was sponsored by Security Abstract and Title and Angel and Company CPAs. Other teams were sponsored by the Barry County Advertiser; the Cassville Democrat; the Cassville Branch Library; the Cassville School District; Ellis, Cupps and Cole; First State Bank; Freedom Bank; State Farm Insurance; and Willis Insurance. This year’s Trivia night champions, the Fighting Trout, also known as Cassville High School’s Knowledge Bowl Team, are pictured above. From left to right: Cole O'Neill, Zane Mebruer, Eli Herrin, Nolan Crane, Claire Hurst, Sam Holman, Michael Hall and Olivia Holman. The Smarty Pants Award was given to The Newsies, a team from the Barry County Advertiser and Cassville Democrat. Pictured above, from left to right: Isaac Estes-Jones, Kyle Troutman, Charlea Estes-Jones, Wade Hermansen, Kelsey Fields, Amanda McCollum and Jared Lankford. The winners of this year’s Trivia night Dum Dum Award was Team Pi, a group of Cassville Middle Schoolers. Pictured above, in the front row, from left to right: Dixon Reid, Jillian Lecompte, Jonathan Oliphant and Kalia Miller. Back row: Dulce Rivera, Jenna Crim, Charley Melton-Hovland and Jacob Martinez-Maldonado.